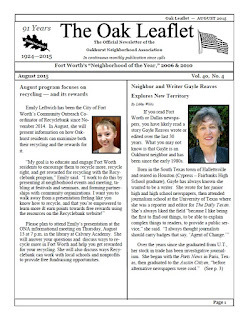 Oakhurst Neighborhood Association, Fort Worth, Texas: August Oak Leaflet Now Online! Check out this month's issue of The Oak Leaflet online! This edition gives us a recap of July 4th activities, outlines our upcoming August meeting topic, features an article on our neighbor Gayle Reaves, showcases our latest Yard of the Month, and reports on both the Welcome Committee and upcoming Police and Firefighters Appreciation Dinner.